Some of you might have wondered about the update that I announced in a couple of posts earlier. All sort of speculations like marriage, new job, stealthy startup, etc., were around. Let me put an end to those through this post. I am happy to be present in the list of contributors for Evolution. 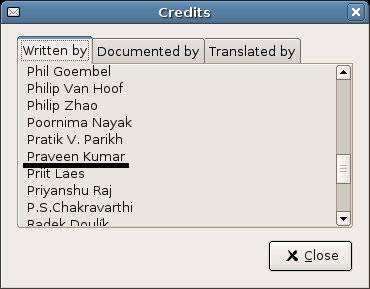 My name found its place in the 2.4 release of Evolution. Hurray! I have joined Novell today. The climate is too good in Bangalore. It rained yesterday as soon as I came here. The work place is good and the people are good. I bet I am going to enjoy this work. After a long thought, I have decided to quit HCL Technologies. I have decided to persue my career in a different line, a bit away from Networking. Wait for some more time for a detailed update on this.